Scottish duo Peter Wright and Gary Anderson will clash in the bwin Grand Slam of Darts semi-finals on Sunday after claiming Friday night victories at the Wolves Civic. World number two Wright reached the last four for a second successive year by ending the hopes of Lakeside Champion Glen Durrant in their quarter-final contest. Durrant was the only BDO representative in the 32-player event to win through to the last eight, but saw the clinical finishing which he had shown during his previous four games desert him in the first half of a 16-10 defeat. The victory sees Wright move through to Sunday's decisive final day as the number two seed aims to claim the prestigious Grand Slam title for a first time. Wright - whose painted head was supporting the Children in Need charity - capitalised on missed doubles from Durrant to win the opening two legs, before the Lakeside Champion took out double ten and 71 to level. The next two were shared before Wright broke with a 68 finish to move 4-3 up, and he won the next three legs to open up a four-leg advantage. Durrant took out 89 to hit back, but Wright punished further missed doubles as he continued his charge with five further legs before five wayward darts from the Scot allowed his rival to hit back to 12-5. Durrant also finished 124 on the bull as he claimed a sixth leg of the game, and back-to-back 14-darters cut the gap to 14-8 before he landed six perfect darts with two maximums in a 12-darter as he continued his revival. However, two wired darts at double eight allowed Wright in to move 15-9 up, with Durrant then coming one dart away from a perfect leg in the 25th as he landed back-to-back 180s again, a seventh treble 20 and then treble 19 only to miss double 12 to achieve the feat. 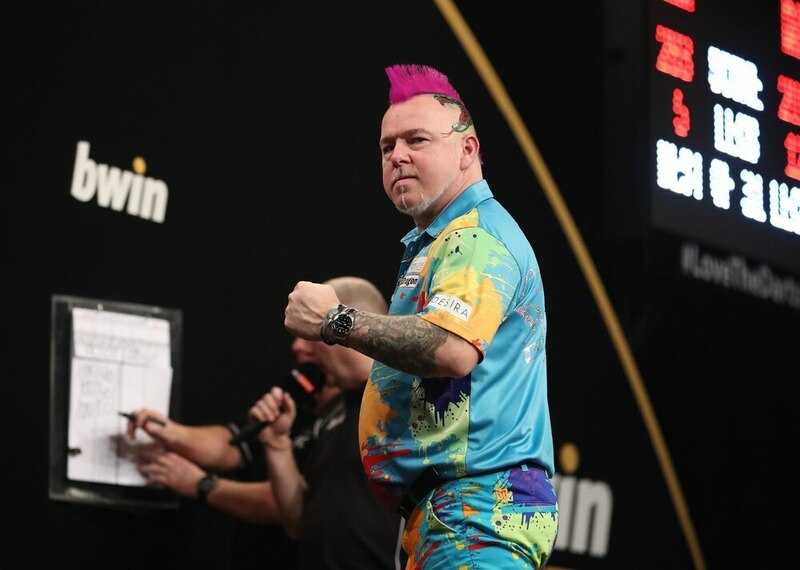 He returned to hit double 12 at the second time of asking to complete a ten-dart finish, but he was unable to nail the bullseye for a second 124 checkout in the next leg as Wright closed out victory on double five. "I'm obviously delighted with the result but not with the way I performed," said Wright. "I got to the semi-finals last year so I've equalled that but hopefully I can go further now. "You want to hit the big averages like Michael van Gerwen and Gary Anderson are doing, and if I want to win this tournament I'll have to - but I'm still learning all the time. "Glen's an awesome player and a lovely guy, and I was geeing him up backstage but I didn't want to gee him up so much that he almost him a nine-darter! I wish him all the best at Lakeside and he deserves to go and win that again." Durrant, who missed 32 darts at a double during the game, admitted: "I'm incredibly disappointed in my performance tonight. I don't know why I played like that. "I really wanted to put on a show tonight - what an opportunity, to play Peter Wright live on Sky on a Friday night. It was my moment and it just didn't happen. "The whole Grand Slam is brilliant and certainly for the BDO players. The crowd were great but early doors I was really poor and I don't know why." Number two seed Anderson, meanwhile, battled past Mensur Suljovic with a 16-12 success as the 2011 finalist landed nine 180s and averaged almost 102 to end a three-game losing run against the Austrian. Anderson responded to Suljovic's 100 finish in the opening leg by taking out 61, 68 and 90 to move 3-1 up, and he also led 5-3 before the Champions League of Darts winner took out 113 and then punished five misses from his rival to level. Anderson claimed the next four legs without reply to move 9-5 up, but missed a trio of doubles in leg 15 as the Austrian again hit back to win three in a row. Suljovic remained in touch at 10-9 and 11-10, but crucially missed double 16 to level in leg 22 as double four edged Anderson further ahead, double six created a three-leg gap and a 72 finish moved him two legs away from the win. Anderson landed a 180 for a fourth successive leg in the 25th, but missed the bull for a 126 finish as Suljovic completed a 71 combination to remain in the hunt and then broke on double nine to pull back to 14-12. However, a miss at double 12 allowed Anderson a let-off for a miss at tops, and the Scot then capitalised on three further misses from Suljovic gave him the chance to seal victory on double four. The quarter-finals conclude on Saturday night (8pm), when six-time Grand Slam champion Phil Taylor faces World Grand Prix champion Daryl Gurney before reigning champion Michael van Gerwen plays European Championship finalist Rob Cross.